Here’s my 2019 list of books I’ve read and movies I’ve watched, with my rating in parentheses (out of 10). See my current reading list at GoodReads, or my 2019 Year in Books. 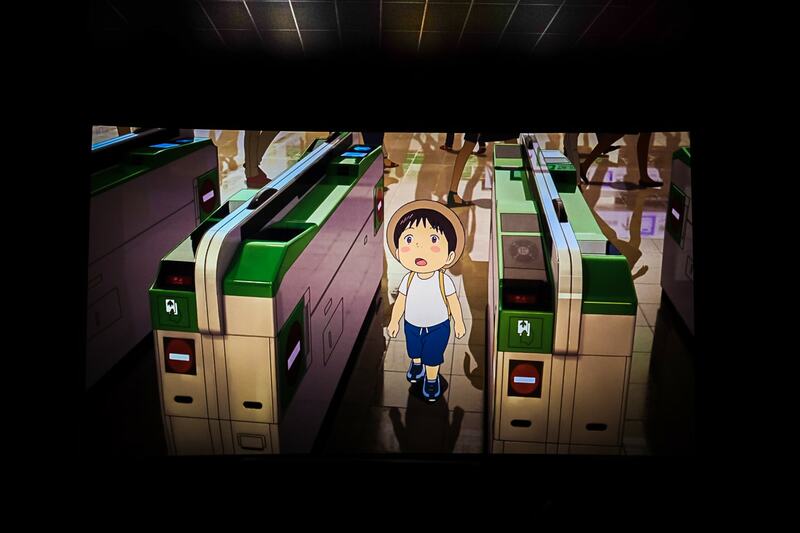 Tonight I went to see Mirai (未来のミライ) at the local theater, and I loved it! 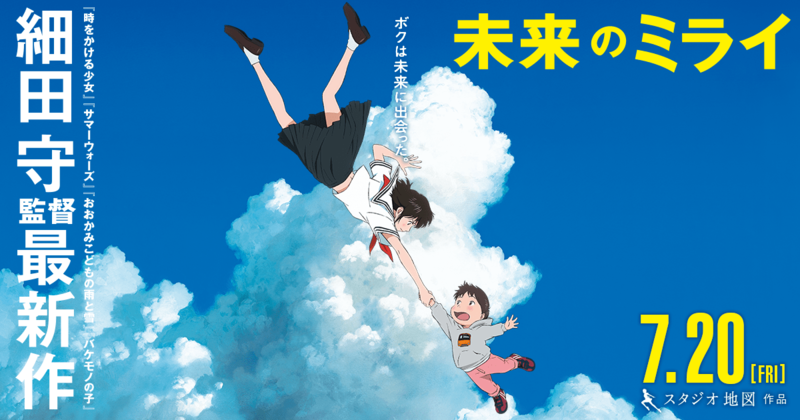 Mamoru Hosoda’s latest film is kind of a slice-of-life type anime, mixed with a bit of fantasy. The story itself centered around a young boy named Kun, and how his family’s life changes after his sister, Mirai, is born. That fantasy portions of the story were a bit of a mystery as to why they were happening, and no explanations were given, which is fine. Actually, I was happy that no effort was made by the film-makers to try to rationalize how these time travel sequences (and other fantastical details and characters) existed, and that was kind of the magic of the film for me. We get to travel in time and to amazing places without the burden of things needing to make sense. I suppose that is why animation is so special. We are already removed from the real world because of the artwork, and so the leap to the fantasy world is very natural. As a parent, I felt like I had a special connection to the film because a lot of the story revolved around the mother and father and their domestic roles, and we get to see scenes from their own childhoods. It brought back a lot of parenting memories when my kids were small as well. So it was nice to see a lot of screen time devoted to the parents. Not only that, but we get to see the lives of Kun and Mirai’s great-grandparents as well. My favorite parts of the movie were these scenes from the past, where Mirai explains that a person’s efforts can have a huge impact on the future. It gave me a lot to think about. These lessons from the past make me want to take care of the present day because who knows how it might affect the future? If you get the chance to see Mirai in theaters, I would recommend doing so! But if you can’t, then be sure you rent it when it is available. I am planning on buying the Blu-ray for my collection, especially because I want to study the character designs, specifically the father and mother. Plus I need to see the motorcycle scenes again. Those were so cool! 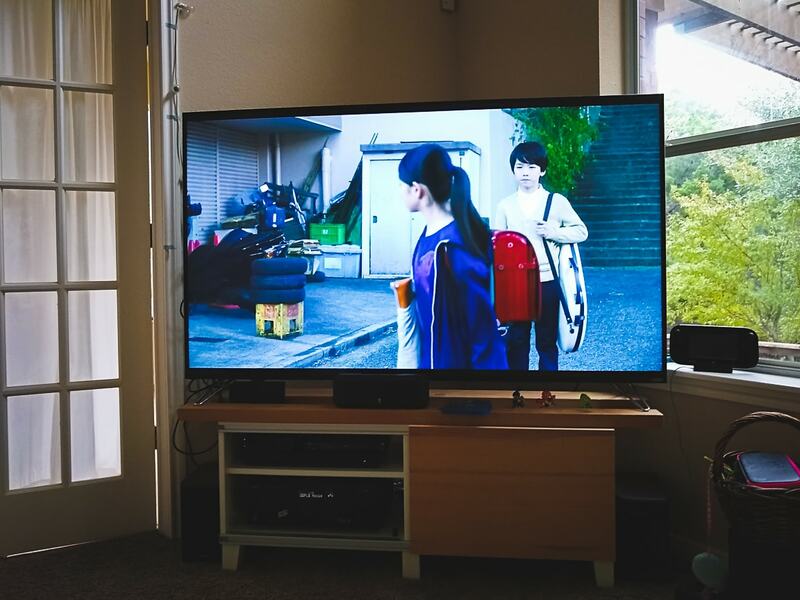 I give Mirai (未来のミライ) a 9 out of 10. The Japanese movie Close-Knit (彼らが本気で編むときは) was on TV Japan the other day, and it looked interesting (and is subtitled) so I watched it, even without knowing much about it. 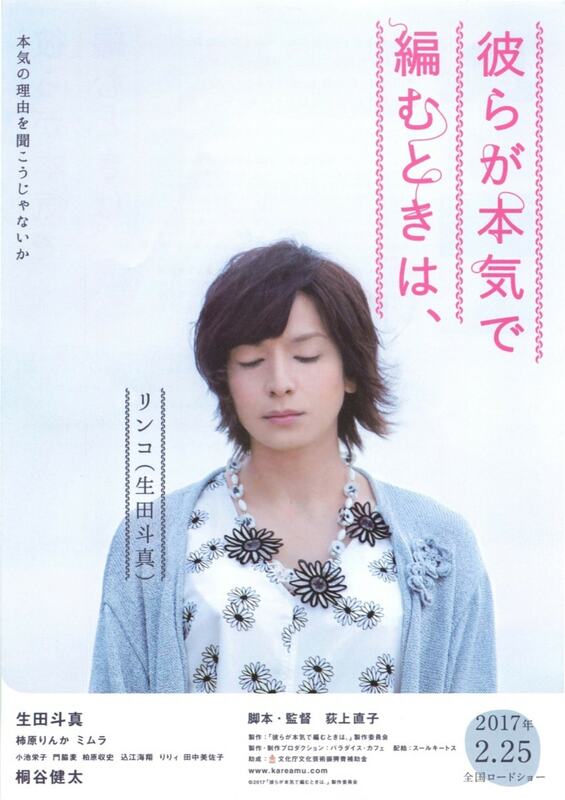 I just knew that a Johnny’s member was portraying a transgender person in it. Today happens to be Transgender Day of Remembrance, so I thought I would write a bit about it. Well, I will start by saying the movie was excellent. The acting, plot, dialog, and overall feeling was sensitive and heartfelt. 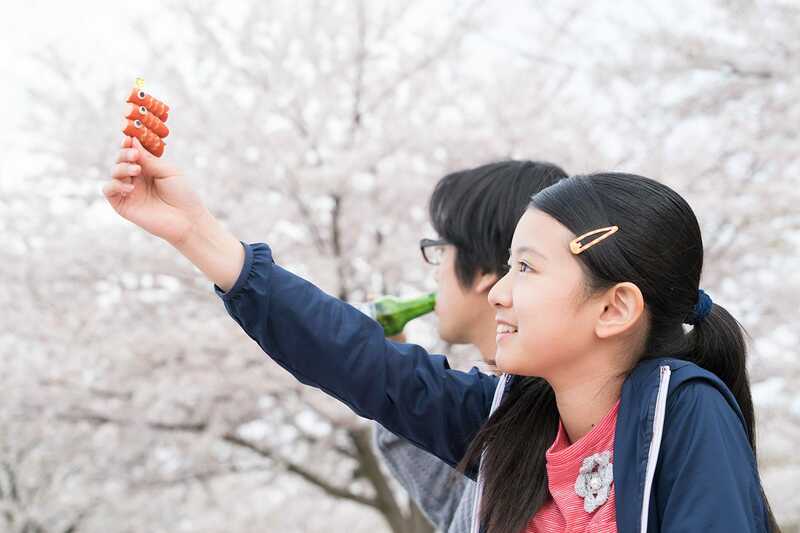 The story is told through the eyes of Tomo (柿原りんか), an 11-year old girl, who is forced to move in with her uncle, Makio (桐谷健太), and his girlfriend, Rinko (生田斗真), who is transgender. Over the month that the three live together, a wonderful relationship develops amongst them and many issues are discussed. There aren’t any plot twists, but the story doesn’t need any. It’s straightforward and compelling without needing to resort to gimmicks. It was refreshing to see issues that many people often wonder about being asked and discussed so openly and without taboo. Maybe it’s because the 11-year old girl is at an innocent age where she hasn’t been influenced so much by grown-ups and can look at people with a more open mind. Her inner questioning of the beliefs of others is palpable, and she ponders on what makes something “wrong” and what makes something “right”. And because of this, I felt she was one of the wisest people in the story. Maybe it’s important to keep a young, non-judgemental mindset throughout life. Another important part of the story was about Tomo’s classmate, Kai, and the struggles he has when he realizes he is gay. The discrimination and teasing from his classmates were sickening. One of the most powerful scenes was when he talked to Tomo about what he was feeling and how he didn’t understand it all. It was so moving! There was a similar scene in which a young Rinko also breaks down as she deals with being a girl in a boy’s body. But the difference between the two was that Rinko had a completely supportive mother (田中美佐子), while Kai’s mother (小池栄子) is threatened by “strange people” and Kai fears coming out to her. It’s kind of simplistic situationally, but I imagine that these are common scenarios. Lastly, the story brings up the subject of child abandonment, since Tomo’s mother doesn’t come home for a month, which is why Tomo moves in with her uncle Makio and Rinko. The mother (美村里江) is set up to be the villain, but in one of the climactic scenes, we find out a little about her own insecurities and flaws, and the strong bond that exists between mother and daughter, however strained the relationship might be. When she broke down, I just about lost it!  That was an incredible scene. I have to point out that the acting was superb in the film, of course from the starring roles, but also the supporting cast like Tomo’s mother. You know, I admit not really thinking much about transgender issues in the past, but I’ve always been supportive of equal rights for all people. I guess I haven’t given it much thought because I think people are people… I don’t care about gay, straight, transgender, etc. People can be good or not-so-good, whatever their lifestyle. However, watching Close-Knit just reminds me that people deal with issues that might not involve me personally, nor be readily apparent, but that I should try to be empathetic towards everyone. If you have the chance to watch Close-Knit, I recommend doing so. I for one gained some insight into the struggles of LGBT people, and transgender in particular, and I think I have become a better person for it. I think you will too. 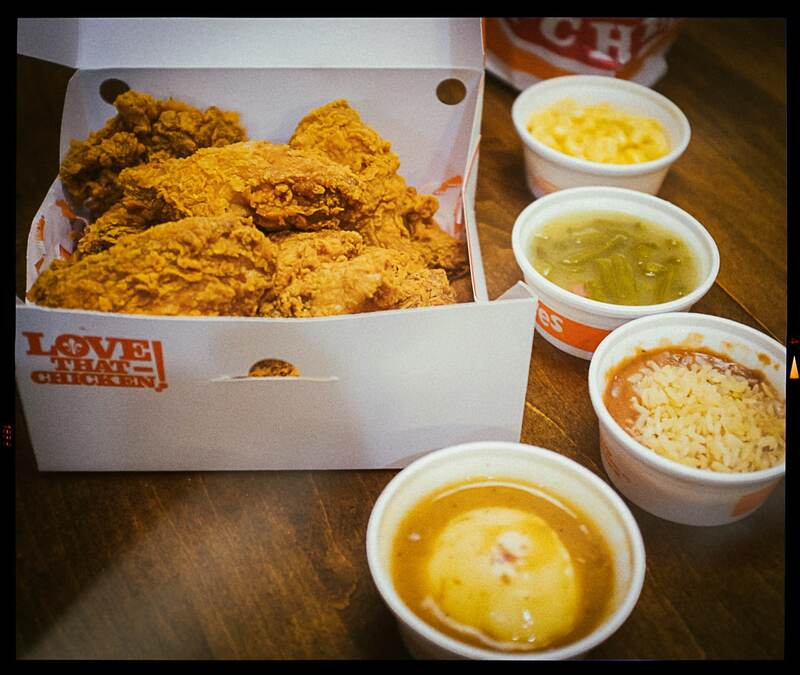 I noticed that a few people in my extended family mentioned their fondness for Popeye’s Fried Chicken in the family Whatsapp group and it has been sitting in the back of my mind because I have never actually tried Popeye’s before. So this evening Bay and I visited the nearby restaurant and ordered the 8-piece special, with four different side items. I had pretty high expectations of the food because of the surprising enthusiasm on Whatsapp, but unfortunately, I was disappointed with both the chicken and sides (mashed potatoes, mac n cheese, green beans, and red beans & rice). While the skin/breading of the chicken was super-crispy, it didn’t have a really good or special taste (KFC is better IMHO). It was just basic fried chicken. And everything, including the sides, was really salty. In other news, I watched a couple of Japanese movies today – the excellent Close-Knit, and an older movie A Fisher Wife’s Tale, starring Hibari Misora. Yes, it was a lazy Sunday. Sitting under a warm kotatsu watching movies was kind of perfect, actually! I hope you had a wonderful Sunday! This evening I watched a movie that I’ve wanted to see for a while now. 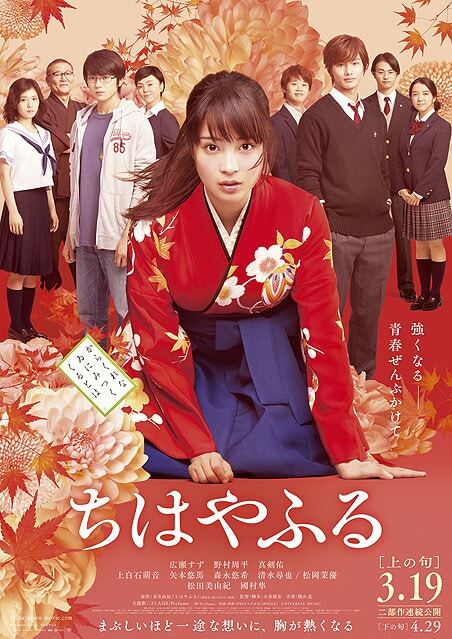 Chihayafuru: Kami no Ku (ちはやふる　上の句) is the movie version of a manga and anime, and stars Hirose Suzu as a high school student who forms a karuta club. Karuta is a game combining Japanese poems, cards, and quick reflexes. It’s fascinating to watch! Anyways, I was deeply moved by the different aspects of the story, and even felt tears welling up a few times! That was completely unexpected. This is the first movie in a three-part series, so I am really looking forward to watching the other two.